ASG’s screw press dewatering machine, designed specifically for our PE film washing line, is an efficient way to remove moisture from a material stream. 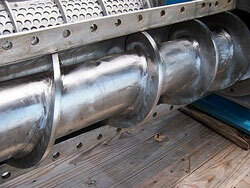 In fact, our screw presses are commonly used in food processing, paper & pulp industries, sewage disposal, and much more. This robust piece of machinery offers excellent moisture reduction without the high cost (electricity cost) of operating thermal heaters. 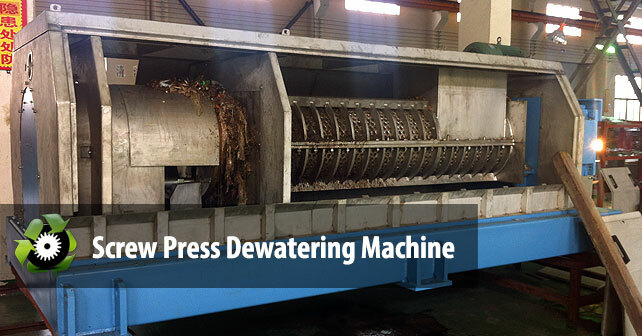 At the center of our screw press dewatering machine is a screw shaft of increasing diameter. The screw shaft is most narrow at the opening where the plastic material enters via the vertical feeder. Surrounding the screw shaft is a thick-walled, constant diameter outer tube lined with holes for water outlet. 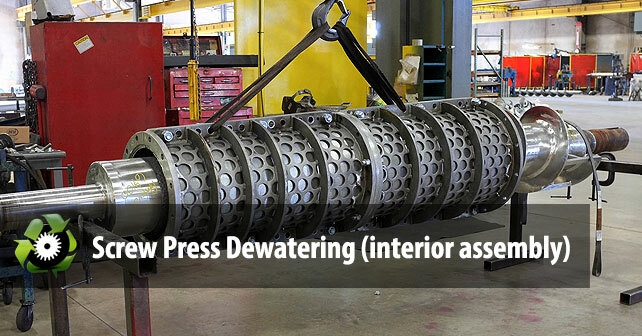 The common dewatering screw press for industrial recycling applications is 4-6 meters long, but can be increased or decreased based on your specifications. As the wet plastic feed stock is feed into the feeder, the screw shaft slowly rotates moving the plastic machine forward. The screw shaft will becomes thicker in diameter, the plastic becomes more and more compacted against the outer casing wall. The moisture from the plastic material is squeezed out and exits the tiny holes. At the end of the horizontal screw press, the diameter of the screw shaft is only slightly smaller than the inside diameter of the outer casing. It’s through this narrow gap that the dried plastic material exits the screw press. A well manufactured screw press will bring moisture content to acceptable levels of below 15%. Plastic Recycling Machine © 2013. All Rights Reserved. Sitemap. Sorry!.. Right click has been disabled for Plastic Recycling Machine.